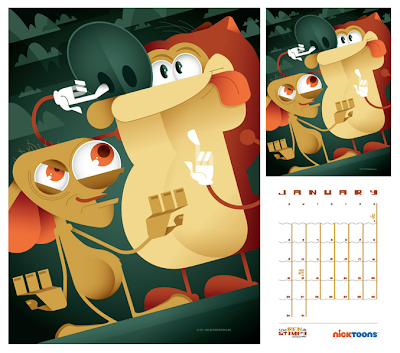 nicktoons commissioned me in october of 2009 to create a 12-month calendar to be used as a promotional giveaway. after a few months of intense work, the project was finished. all i needed was the green light to post images of my work. then, months went by. and....nothing. the calendar never printed. apparently, a few images hit legal snags that halted production. i thought the project was dead and buried until i received an e-mail this past october asking me to create seven replacement images that would get the calendar polished up and ready for 2011.
well, the dust has settled, the new pages have been completed, the calendars have printed and i can finally show my work. the challenge in january's page, "the ren & stimpy show" was that i wanted to make the hugely iconic characters instantly recognizable, yet still put my own twist on them. this is the second draft, and i think it accomplishes that goal much better than the first. all in all, great fun to work on characters that i love. Your work is so badass! I need to get one of these calendars.